F Brad Ross (Portland, 2007-12) has signed a one-year contract with the Heilbronner Falken (Germany, DEL2). This season, with the Iserlohn Roosters (Germany, DEL), Ross had four assists in six games. His season ended prematurely due to a hand injury. Heilbronner’s head coach is Gerhard Unterluggauer (Brandon, 1995-97). . . .
F Dalibor Bortňák (Kamloops, 2008-11) has signed a one-year extension with Banská Bystrica (Slovakia, Extraliga). This season, in 49 games, he had 10 goals and 22 assists. coach in Slovakia next season. It took more than three years, but former WHL coach Dave Hunchak is back in the game. Hunchak has been named associate coach with Banská Bystrica, which won the Slovak Extraliga this season. Hunchak, who got a two-year contract, will work alongside head coach Vladimir Országh. Hunchak, 43, coached in the WHL for 10 seasons, with the Swift Current Broncos, Moose Jaw Warriors and Kamloops Blazers. 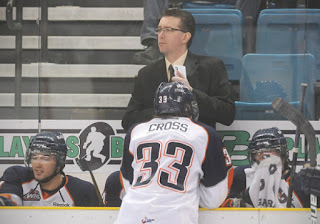 He was the head coach in Moose Jaw for four seasons (2007-11) and spent two-plus seasons in Kamloops. Hunchak was the Blazers’ head coach when he left the team while it was in Spokane in January 2014. More than a year later he spoke with Allan Maki of The Globe and Mail for a piece headlined: Hockey world steps up mental health support. But is it enough? Banská Bystrica was looking to replace Richard Zednik, who had left its coaching staff, and chose to get in touch with Hunchak. Bast and Wishart played for Hunchak in Moose Jaw. Bast played in Banská Bystrica in 2015-16, while Wishart just completed his first season there. Hunchak will leave for training camp in mid-July. Excited to be returning to Bruneck and @hcpustertal Looking forward to working with the great group of players and staff we have there. The Calgary Hitmen are looking for a new general manager, having moved Mike Moore up to vice-president and alternate governor on Tuesday. Might they also be in the market for a head coach before too long? Mark French, their 46-year-old head coach, is said to be in the running for the head-coaching job with the Fribourg-Gotteron Dragons of Switzerland’s National League A. Earlier this month, the Swiss newspaper La Liberte reported that French was the front-runner to replace Larry Huras, and that French was likely to meet with team president Michel Volet in the near future. French has completed three seasons as Calgary’s head coach. He received what the team said was a “multi-year” contract extension on June 20. Before signing with Calgary, he was the head coach the AHL’s Hershey Bears for four seasons and with Medvescak Zagreb of the KHL for one season. The Saskatoon Blades had two first-round selections in the 2017 WHL bantam draft and signed both of them on Wednesday. . . . D Aidan De La Gorgendiere, the fifth overall selection, is from Langley, B.C. De La Gorgendiere played this season at the Yale Hockey Academy. He had 26 points, including five goals, in 30 games with the bantam prep team and added two goals and two assists in four games with the Elite 15s. His parents grew up in Saskatoon so he has a lot of family there. . . . The Blades also signed F Kyle Crnkovic of Chestermere, Alta., who was the 10th overall pick. He had 79 points, 40 of them goals, in 30 games with the Pursuit of Excellence bantam prep team. . . . The Blades also announced the signing of F Braden Plaschewsky, who was taken in the second round with a pick acquired from the Red Deer Rebels for F Mason McCarty, 20. Plaschewsky, from Calgary, had 72 points, including 30 goals, in 35 games with the bantam AAA Calgary Bisons. F Tim Vanstone has made a commitment to the U of Calgary where he will play for the Dinos. Vanstone, from Swift Current, played out his junior eligibility this season. He was the Raiders’ captain for the past two seasons. This season, he had 30 points, including 12 goals, in 68 games. In 299 career regular-season games, all with the Raiders, he had 36 goals and 58 assists. The Raiders selected him in the third round of the 2011 bantam draft. D Josh Mahura of the Regina Pats has signed a three-year entry-level contract with the NHL’s Anaheim Ducks. From St. Albert, Alta., Mahura was a third-round pick by the Ducks in the NHL’s 2016 draft. . . . Mahura had two goals and six assists in 51 games as a 16-year-old with the Red Deer Rebels. He missed all but two games of the 2015-16 regular season due to a knee injury, but came back to play in 17 playoff games, picking up two goals and two assists. He was dealt to the Pats this season -- he had nine goals and 24 assists in 39 games with Red Deer, and eight goals and 12 assists in 34 games with Regina. But he really caught fire in the playoffs, putting up eight goals and 13 assists in 23 games as the Pats got six games into the championship final before losing to the Seattle Thunderbirds. The Vancouver Giants have signed D Tanner Brown, who was a second-round pick in the 2017 WHL bantam draft. From Kelowna, Brown had seven goals and 22 assists in 26 games with the Pursuit of Excellence’s bantam prep team this season. Ryan McGill of the Owen Sound Attack and Kris Knoblauch of the Erie Otters were named the OHL’s first- and second-team all-star coaches on Wednesday. Both are former WHL players and coaches. . . . McGill played for the Lethbridge Broncos, Swift Current Broncos and Medicine Hat Tigers (1985-89) and was a coach with the Edmonton/Kootenay Ice (1996-2002, 2012-15). . . . Knoblauch played for the Red Deer Rebels, Edmonton/Kootenay and the Lethbridge Hurricanes (1996-99). As a coach, he spent one season (2006-07) with the Prince Albert Raiders and five (2007-12) with Kootenay. . . . Knoblauch guided his Otters to the OHL championship and they are in Windsor, preparing for the Memorial Cup tournament that begins on Friday. Two of the other three head coaches also have WHL ties. Steve Konowalchuk, who is in his sixth season with the WHL-champion Seattle Thunderbirds, played two seasons (1990-92) with the Portland Winterhawks. . . . Rocky Thompson, in season No. 2 as the head coach of the host Windsor Spitfires, played four-plus seasons (1993-97) with the Medicine Hat Tigers, finishing up with 22 games with the Swift Current Broncos. 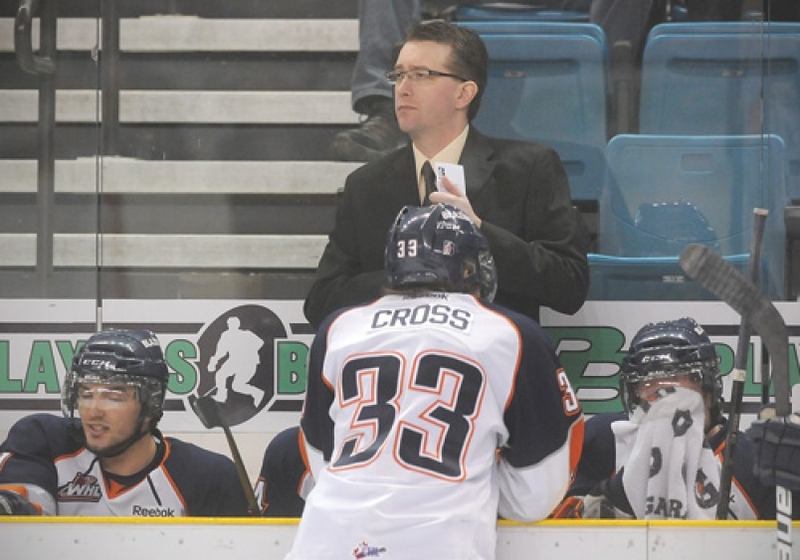 He began his coaching season with three seasons (2007-10) as an assistant with the Edmonton Oil Kings. If you are interested in Part 2 of Lucas Aykroyd’s interview with Dave King, it’s right here. These days, King is working as an assistant coach with Team Canada at the IIHF World Championship. . . . BTW, King jogs every morning. In fact, he has jogged every morning for almost 30 years without missing a day. Jesse Dorrans no longer is the general manager and head coach of the AJHL’s Drayton Valley Thunder. The team revealed Wednesday morning that Dorrans “has resigned due to personal reasons.” . . . Dorrans spent one season with the Thunder, going 17-39-4 to finish sixth in the eight-team Viterra North Division. In the playoffs, the Thunder was swept from a best-of-five first-round series by the Spruce Grove Saints.